The base entry of the phiSITE database is defined as a site, representing one regulatory element present on a phage genome. This can be either promoter, operator, transcription terminator or attachment site. Site element can be segmented into several subsites (if known) - particular cis-regulatory signals (e.g. -35 and -10 for prokaryotic promoter). The database provides also references to the method of evidence for experimentally confirmed sites. All sites are linked to the other phiSITE tables describing the phage and its features. Information about complete phage genome is also included (if available), together with names and positions of all known genes. 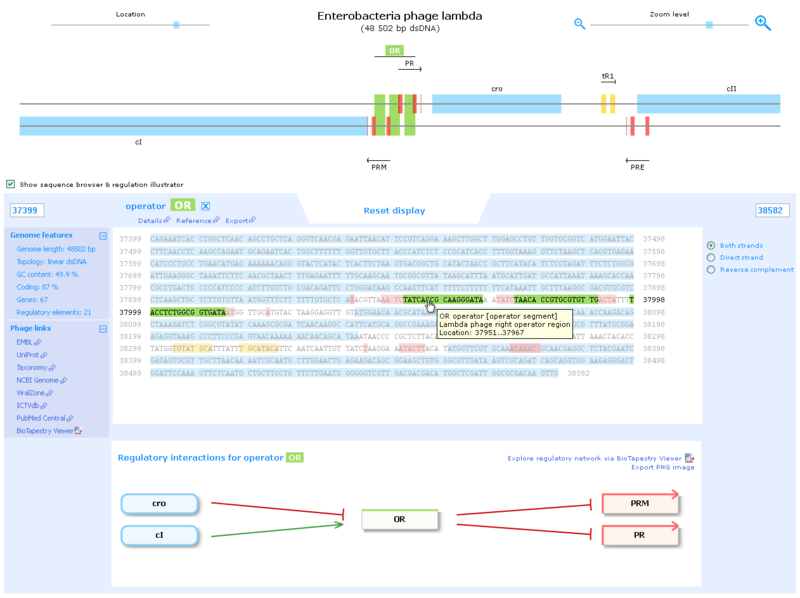 phiSITE keeps also updated information about phage and phage host taxonomy, together with numerous links to other database resources described in section "Phage genome browser" below. There are also several accompanying analyzing tools under development, accessible in the Tools section. phiISTE web portal conforms to XHTML-1.0-Transitional standard and should work on all compliant browsers. phiGENOME browser (one part of phiSITE portal) uses also other technologies (Adobe Flash, AJAX, SVG). It was developed on MS Windows platform, where all major browsers (Firefox, MSIE, Google Chrome, Safari and Opera) are fully supported. Other operating systems were tested only partly and occasional bugs may occur (e.g. problems with mouse scroll zoom). An Adobe Flash Player plug-in 9.0 or higher is required to run phiGENOME browser with all its functionalities. If mouse scroll function is not working for Mac users, we advise to upgrade Adobe Flash plugin to the latest version. This section provides general information about the phiSITE database portal. User can search the content of a database using Quick Search or Advanced Search. Search terms are looked up either in all text fields (phage name, host name, site name, site description or site type) or in a single field selected by a user. In Advance Search, different search fields for each search term can be specified, with an optional usage of wildcards (wildcards are always used in Quick Search). Search results are provided in a form of table with customizable order. Each entry includes site name, link to the phiGENOME browser and Regulation secton (if defined), site type (promoter, operator, terminator or attachment site), method of evidence ( for experimentaly confirmed and for predicted sites), source reference (PubMed article, book or EMBL entry), phage details and semi-graphical representation of DNA segment containing the site. All sites are linked to the Sequence Ontology thesaurus. Arbitrary number of entries from search result page can be manually selected and exported using browse and export module described below. Set of phiSITE entries can be exported using dynamic browse and export module and used in further analyses in a variety of bioinformatics tools. User can select a group of sites according to the phage or phage host taxonomic hierarchy. Evidence (experimental, predicted or both) and site and subsite types can be also selected. Each taxonomic selection step is coupled with background counting of sites currently selected. After selection, user has an option (i) to build motif representation for selected sites, (ii) to export sites as FASTA sequences or (iii) to export selected site in XML format. Selecting Build motif representation is followed by a sequence alignment assembly process mediated by a ClustalW2 algorithm and the motif is exported in several output formats: TRANSFAC database, FASTA, Patser, PromScan, PWM (Postion Weight Matrix) and Sequence logo. XML format is based on XML version 1.0 specification and the output file is coupled with XML DOM document. This section provides detailed information about phage taxonomy, phage genome and phage gene regulation as well as numerous links to other related databases. User can select the phage of interest from the pull down menu. If the data are not available for the phage, its name is in gray an can not be selected. Basic information about the phage is summarized in this table. Besides the phage and phage host taxonomical classification, user is presented with links to the EMBL, UniProt, Taxonomy, NCBI Genome, ViralZone and ICTVdb databases. Dynamically generated list of phage related articles in PubMed Central and two other internal links (BioTapestry Viewer - see below, and direct link to the list of all regulatory sites associated with a phage) are also present. We have adapted BioTapestry tool (Longabaugh et al. 2009) for visual representation of phage GRNs (Gene regulatory networks). Gene regulation interaction information is extracted from scientific literature and entered into the model. Source type 'gene' is used for genes and gene products, and source type 'box for regulatory sites. Several types of interactions are described in the BioTapestry model: (i) initiation of transcription of a gene from promoter, (ii) activation of transcription by a product of phage gene, (iii) repression of transcription by a product of a gene binding to the operator of target promoter, (iv) repression of transcription by the operator negatively influencing promoter, (v) termination of transcription initiated from the promoter and (vi) antitermination of transcription by a product of antiterminator gene. Positive regulation is depicted as an arrowed line pointing from the master to the slave element (i, ii, iii), negative regulations as a 'T' shaped line pointing to the slave element (iv, vi) and neutral relation as a straight line between master and slave elements (v. Only interactions among the phage genome elements are defined at the moment, though future versions may include also phage host regulatory elements. The portal possesses proprietary graphical genome browser phiGENOME, which consists of three components: (i) genome map viewer, (ii) sequence browser and (iii) regulation illustrator. Genome map viewer is a Flash application which provides dynamic and interactive graphical display of phage genomes. Particular genomic features (genes, promoters, operators, terminators) are depicted as semi-transparent coloured boxes matching their real location and size in a genome. Each type of genetic feature is assigned with a specific colour (genes are blue; promoters are red; operators are green; terminators are yellow and attachment sites are purple). Mouse scroll can be used to zoom in (and out) genome maps in order to perform detailed inspection (up to the primary sequence level). The easiest way to move along genome map is by using a drag-and-drop technique. Mouse over a feature displays pop-up "tool tip" containing basic information about the feature (feature's description, type and location). Selecting arbitrary feature by mouse click makes this feature highlighted and enables set of cross-referencing links associated with the feature. An Adobe Flash Player plug-in 9.0 or higher is required to be installed into user's web browser. Sequence browser (based on precisely formatted HTML tags) affords detailed exploration of genome features on the sequence level. Genome features are highlighted in colours which follow the colour scheme used in the Flash graphics. Mouse over and mouse click events have the same effect as in the genome map viewer. Unlike genome map viewer, only single strand is displayed in the sequence browser, either direct (default setting) or reverse-complement. User may choose whether genome features from a single strand or from both superposed strands will be displayed. To the left from the division of sequence browser, two expandable menus are placed. The one of them comprehend general properties of the displayed phage genome, the second menu contains links to external databases with displayed phage genome. If the gene regulatory network is defined for the phage, link to BioTapestry Viewer is also available. Regulation illustrator, the third part of the phiGENOME, was designed for graphical representation of regulatory interactions between genes and cis-regulatory elements. For any component of defined regulatory network, regulation illustrator depicts the closest regulatory neighbours in the form of directed acyclic graph. Vertices (icons) stand for individual components of the regulatory network and edges (arrows) represent interactions between them. Each type of genetic feature is represented by specific graphical icon. The nature of regulations can be positive (represented by green-coloured common arrows), negative (red T-shaped arrows) or neutral (grey lines). Mouse click on any icon generates graph of regulations for this element. User has an option to download PNG snapshot of any regulatory scheme. For web browsers without native SVG support (e.g. Microsoft Internet Explorer), installation of SVG plug-in is needed. By default, all components of the phiGENOME user's interface are enabled. Optional disabling of sequence browser and regulation illustrator makes the browsing less data-intensive. This section provides graphical representation of regulatory interactions between genes and cis-regulatory elements in the form of directed acyclic graph (using SVG technology). Vertices (icons) stand for individual components of the regulatory network and edges (arrows) represent interactions between them. Selected element is represented by the central icon; elements influencing this element are located on the left; elements influenced by this element are located on the right. Each type of genetic feature is represented by specific graphical icon. The nature of regulations can be positive (represented by green-coloured common arrows), negative (red T-shaped arrows) or neutral (grey lines). Mouse over an icon displays tooltip with basic description of the element. Mouse over an arrow shows tooltip text containing the type of interaction. Mouse click on any icon generates graph of regulations for this element. User has an option to download PNG snapshot of any regulatory scheme. Using BioTapestry Viewer, comprehensive regulatory networks are available. Particular subsets of regulatory network are divided into separate graphical layers. These regulatory subsets are based on the function of the genes, their regulation and time of expression. We provide few simple tools to be used for exploring gene regulatory elements. Each tool is presented with its own help page accessible by clicking the question mark. The program for PSSMs creation and for conversion of PSSM formats. The program for computation of Gibbs free energy distribution in DNA sequence. Tool for promoter search in prokaryotic genomes. Web links related to gene regulation databases and tools. Content of the whole database can be downloaded in XML format. PSSM-convert tool is also available for download and off-line use. Please do not hesitate to contact the authors regarding any problems you can encounter on the phiSITE portal.